Welcome to Just Tyres Reading, your local tyre expert, where we always offer an unbiased opinion on the most suitable tyres for your vehicle. Our Reading fitting centre is a one stop shop for those seeking quality tyres and a supreme installation service. We continuously hold greater stock levels than most other retailers, while our friendly advice and knowledge can help you choose the most suitable tyre fast. We invite all of our customers to select their products from our custom made stock display, while we offer technical information on puncture repair, markings and tracking. Our brightly lit workshop is always kept clean and tidy for your own comfort, while we display clear safety guidelines for customers in each of our fitting centres. Our Rapid Answer Computer System (RACS) is used to provide instant quotes from current stocks and prices, including special offers, so customers can be rest assured that they're getting the lowest prices. We also offer a lowest price guarantee, whereby we refund the difference for customers when they've bought a tyre from another retailer at a lower price. 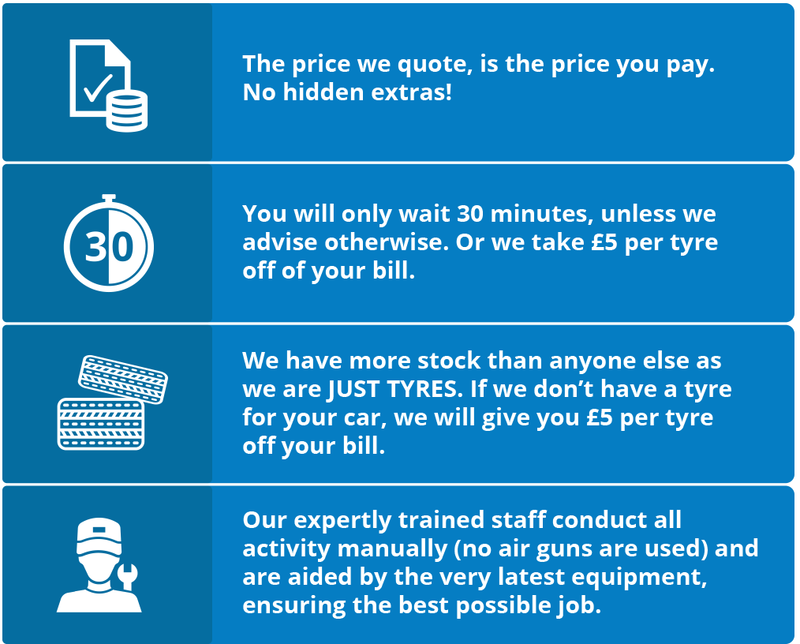 A written quotation or advertisement is required while the tyre must have been purchased within a 20-mile radius and brought to us within 7 days of your purchase. To learn more about our prices and our lowest price guarantee, call 01189 111479 today or visit our Reading fitting centre. Our tyre fitting centre in Reading is based on Oxford Road and close to local amenities. If you need tyres around the Reading area come along and see us, we'd be very happy to assist with any tyre queries you may have or carry out a FREE tyre check at your convenience. If you would like to buy your tyres online and have them fitted at our tyre fitting centre in Reading, just click on the Buy Online image and book your fitting day and time during checkout.